A 14-year-old from Shenandoah won $1,500 Sunday as the winner for the junior division of the Bill Riley State Fair Talent Search. Laura Jean Perry has been entering dance competitions since she was seven years old. She plans to study dance in college and hopes to one day open her own dance studio. "I have a lot of fun doing what I do and I hope I can continue doing it successfully," she says. Perry performed a tap dance solo to a tune called "Stomp." 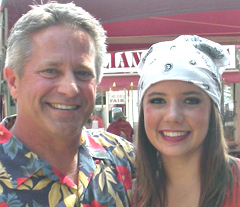 This is the fourth time she’s entered the State Fair competition; two years ago she was named best overall performer. Twenty-one-year-old Paul Child of Des Moines won the senior division of the 50th Annual Bill Riley Talent Search. Child performed "Island of Joy" on the piano and won $5,000 for his first place finish. More than 350 different acts entered this year’s competition which was hosted by Bill Riley, Junior — the son of the man who started the competition 50 years ago.